Les Habegger, who built Seattle Pacific University into a NCAA Division II men’s basketball power during a two-decade tenure at the school from the mid-1950s to the late 1970s, and later worked as an assistant coach and general manager with the Seattle SuperSonics when they won the city’s only NBA championship, died Thursday in Spokane at 92. According to Seattle Pacific, Habegger is survived by son Scott and daughter Julie. Information on services is pending. A native of Berne, IN, Habegger started at Seattle Pacific as an assistant under Ken Foreman in 1956 and became head coach in 1957. Habegger coached the Falcons through 1974, compiling a record of 267-170, the highest win total in school history. He had three 20-win seasons and his Falcons competed in six NCAA tournaments. His 1965 squad reached the Elite Eight. Habegger’s first SPU team went 6-20. Habegger was inducted into the Falcons Hall of Fame in 2004 and the Indiana Basketball Hall of Fame in 2014. Habegger served as a U.S. Army medic in Europe during World War II. After he was discharged from the military, he attended Northwestern College in Minneapolis for two years and transferred to Wheaton College in Illinois to complete his undergraduate work. He enrolled in graduate school at the University of Minnesota. While pursuing his Master’s degree, Habegger served as an assistant coach at Northwestern College. He began to think about getting into coaching as a career. Habegger wrote letters to a number of Christian schools and received a response from Seattle Pacific. 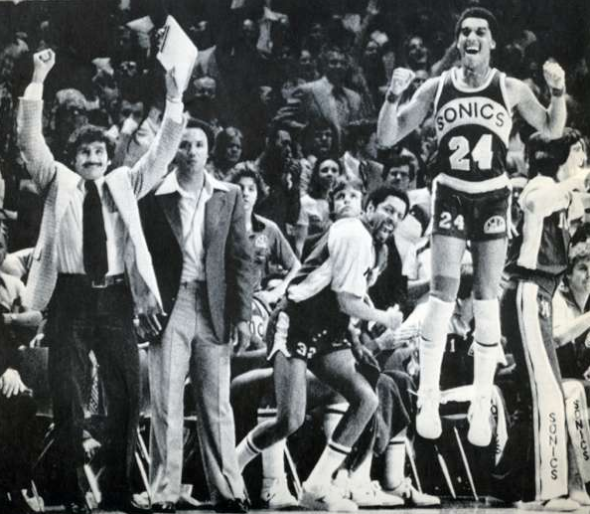 Following his tenure at SPU, Habegger served as an assistant coach under Lenny Wilkens when the Sonics lost the NBA Finals in 1978 to the Washington Bullets and again in 1979 when they defeated the Bullets for the championship. He also had a two-year stint as the team’s general manager from 1983-85. Following his time with the Sonics, Habegger spent nine years coaching in Germany, winning three pro league championships. For the past several years, he has been retired in Gilbert, AZ.